Posted by Hillary Zhang on 12/3/2018 3:41:12 PM. Several weeks ago I wrote an article about 7 best audiobook player apps for Android. And some of iOS devices users ask me to write an article to introduce some useful audiobook player apps for iOS devices. 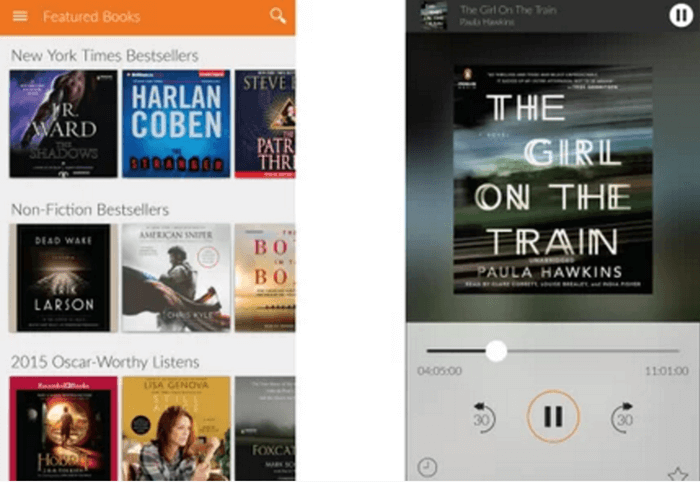 Everyone wants to look for a perfect audiobook player for their iPhone. And it usually take us a lot of time to find a good one which has a nice UI and the ability to remember by position when I last paused and see M4B chapters and their names. If you haven't found your favorite audiobook player apps yet, here I have collected 6 best audiobook player apps for iOS devices for your recommendation. Easy-to-use, clean design, full control and audio from more sources. 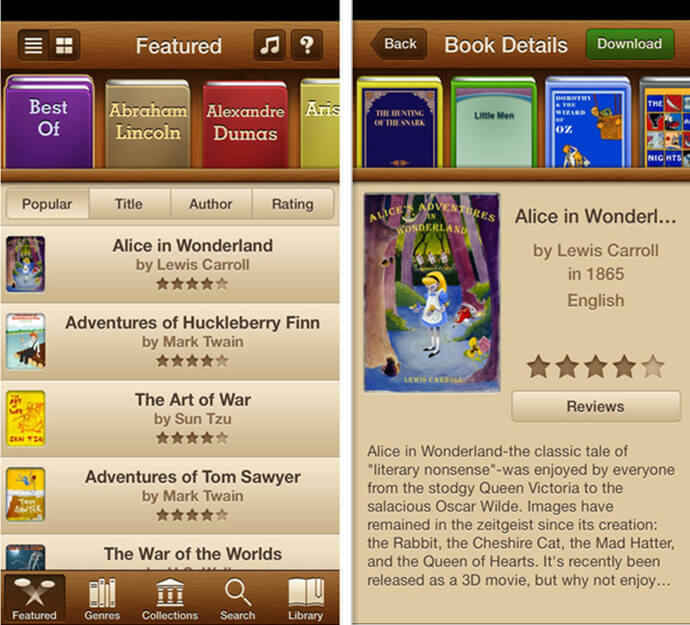 Bookmobile provides a better experience for listening to audiobooks than any other app. While it's interface is a bit hard to get used to, you can use it to change the playback speed with more granular settings than iBooks or the Audible app, skip ahead or back by minutes or seconds and there's even a driving mode, with simplified playback controls for use in the car. Bookmobile can play books you've synced to iTunes or you can use iTunes File Sharing to add files to it directly. You can also add books from Dropbox or other cloud services, and download them from web URLs. 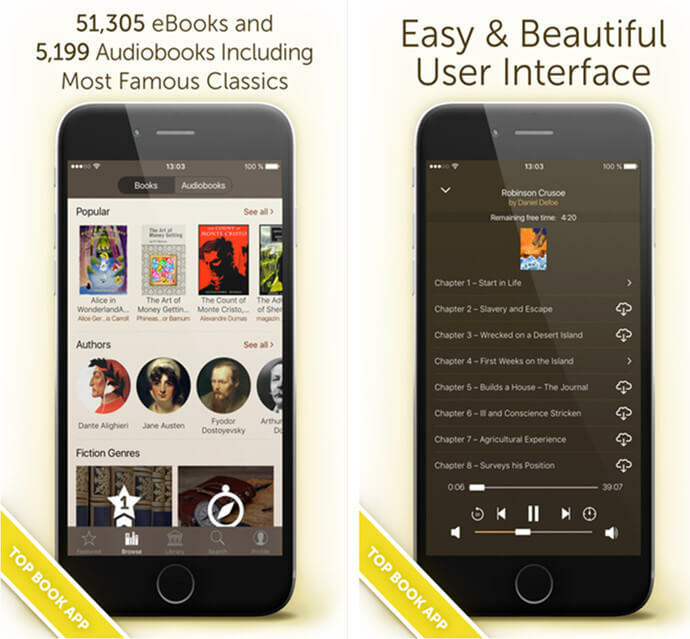 Audiobook lovers always say that Classics is an app designed by book lovers for book lovers because the reading experience far exceeds any reading app available. This app escapes into some of the greatest stories ever written, experiences digital reading in a way that is so natural and so obvious, it just feels right. It begins with a collection of hand-picked literary masterpieces. Features: 1. An intuitive and elegantly designed reading experience with realistic 3D page flips that track to your finger; 2. Flick up and down in your virtual bookcase to view your collection; 3. Tap the table of contents button on the top right for quick navigation between chapters; 4. Classics automatically remembers your place with a satin bookmark when exiting the app or book. All books can be read completely for FREE through this app. This legendary app has got a brand NEW look and functionality! Easy-to-use and many new useful functions! But the very best is that they've doubled the number of books available! Free Books – the door to unlimited reading. Download any of its 51,305 ebooks including the world best known classics and read with its fully featured eReader including dictionary. Features: 1. 51,305 Free Books of various genres -- Download unlimited number of books and read also offline; 2. Create your own personal library and automatically sync between your devices; 4. Back up of your library within our server; 5. Always fresh featured content; 6. Read your own ebooks thanks to the Dropbox integration. Get 8,500+ FREE and 100,000 Premium Audio Books. If you love to read but can't find the time, then this app is for you. Audiobooks HQ has an unprecedented selection of great audiobooks. We have made it easy to find the finest books in the catalog. Features: 1. Controls to speed up or slow down the playback without altering the pitch; 2. Easy search functions to discover the best books and readers; 3. Leave a note for yourself to come back to your favorite parts of the book with the bookmarks feature; 4. 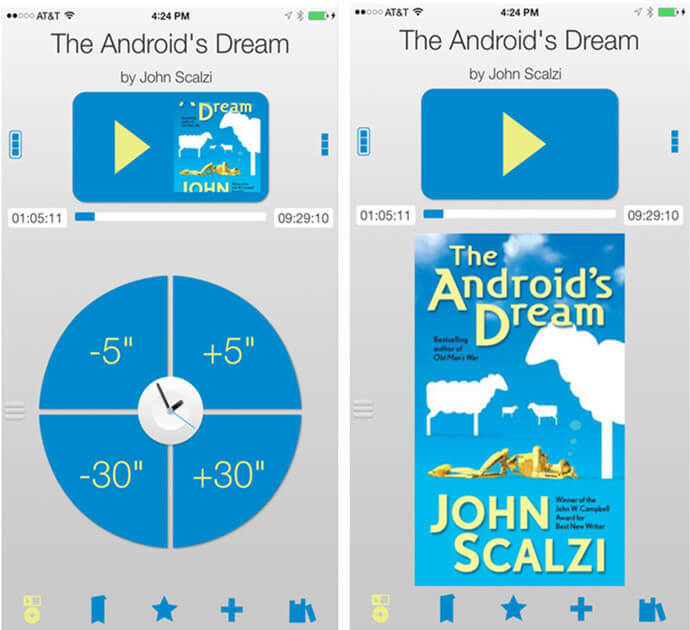 Preview an audiobook before you download it with the book preview player; 5. Once you download your books you can listen on the go, anywhere, no network connection required. The hottest titles, the coolest features and the best service. Audiobooks by Audiobooks.com is the best way to enjoy more books. Experience how audiobooks can transform your commute, household chores, work out sessions and more! 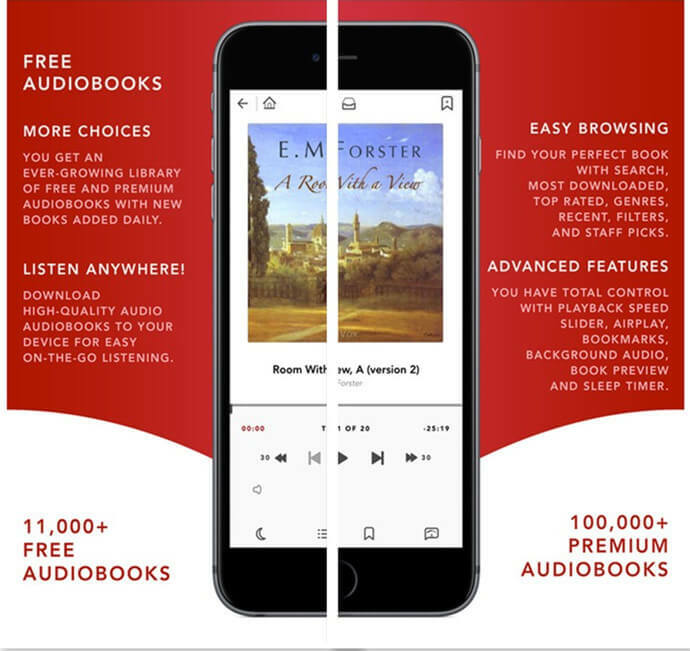 This free audiobook app has a library of 4500+ free audiobooks and more than 100,000 premium audiobooks in every genre including fiction, romance, business, sci-fi, mystery and more. Access thousands of best sellers and hundreds of new releases added every week. Download or stream an audio book to your iPhone, iPad or iPod Touch and start listening to a great story instantly, no need to sync to your computer! 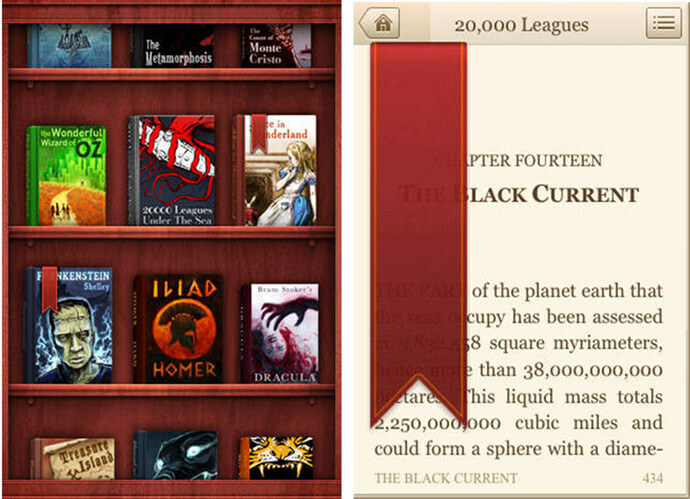 Free Books for iPhone is the world's favorite paid book app. With Free Books once you pay, everything's included. No limits! Now download 23,469 classics in your pocket for less than a cup of coffee. Features: 1. Handpicked Book Collections. English 101, Ghost Stories, Banned Books, Fiction, Novel ... the list goes on; 2. A Perfect Reader. It's beautiful, fast and customizable. Curl up with a book in Night Mode, change font sizes with a tap and turn the page with a simple swipe. You can even upload your own book from Dropbox in epub format; 3. Original Covers. They make public domain books come alive with absolutely beautiful covers; 4. Over 4,000 audiobooks featuring Librivox recordings can be unlocked to go along with the ebook collection. You can easily switch between ebook and audiobook versions while reading. One thing you should notice is that sometimes you may buy some AA or AAX format audibooks which have DRM, but all these audiobook player can't be used to listen to DRM protected audiobooks. Don't worry. 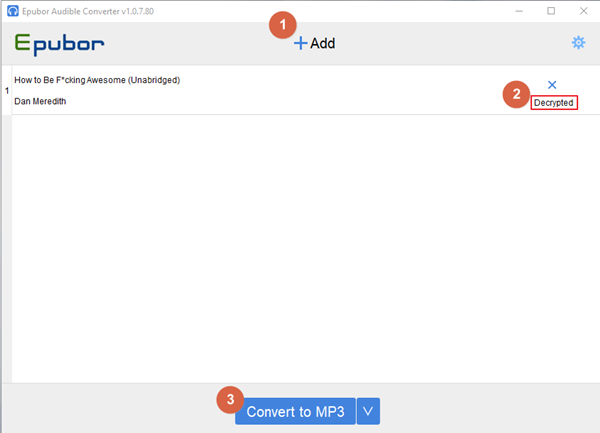 We have the wonderful Epubor Audible Converter allows users to easily strip Audible Audiobooks DRM so your purchased AA, AAX Audiobooks can be played on any device you like! Please go to Epubor website if you want to know more about this awesome software. Though iTunes is the best of the best player for iPhone users, the above are the best 6 substitute audiobook player apps for iOS devices. Hope you have a wonderful reading and listening experience while using these apps. Enjoy reading and listening!